When an opportunity arises, you must seize it. 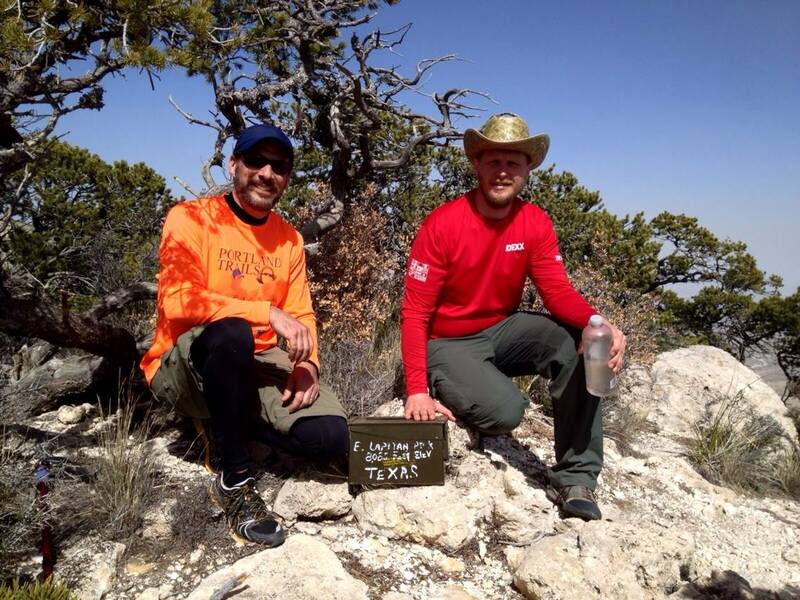 That was the idea when a few friends of mine (John and Mike) and I realized that the highest point in Texas was not too far away from a conference we were scheduled to attend. “Not too far” is probably a relative term as most people wouldn’t be willing to tack on an eight hour drive to the end of a crazy week and a half of conferences. Yet that is exactly what we did. When our conference ended, rather than flying directly back to Maine we rented a car and drove from Austin to the Guadalupe Mountains National Park, stopping at Enchanted Rock State Natural Area, Orla (a ghost town in western Texas), and Carlsbad Caverns, New Mexico, on the way. 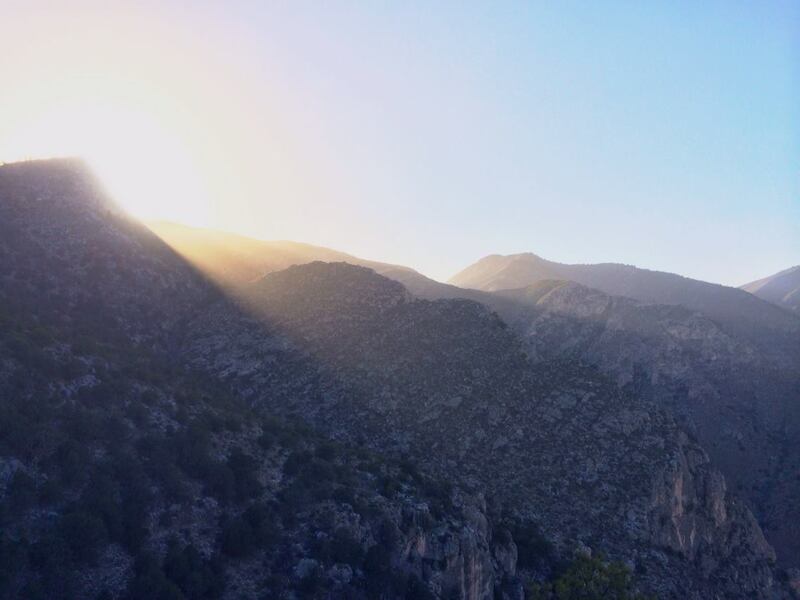 I had done a bunch of research prior to our trip (many thanks to the Redditors on /r/campingandhiking) and discovered that Guadalupe is one of the least visited national parks and its peak season is in October when the leaves change colors. The weather was supposed to be wonderful in March, as long as the wind holds out, and the park would be pretty empty. 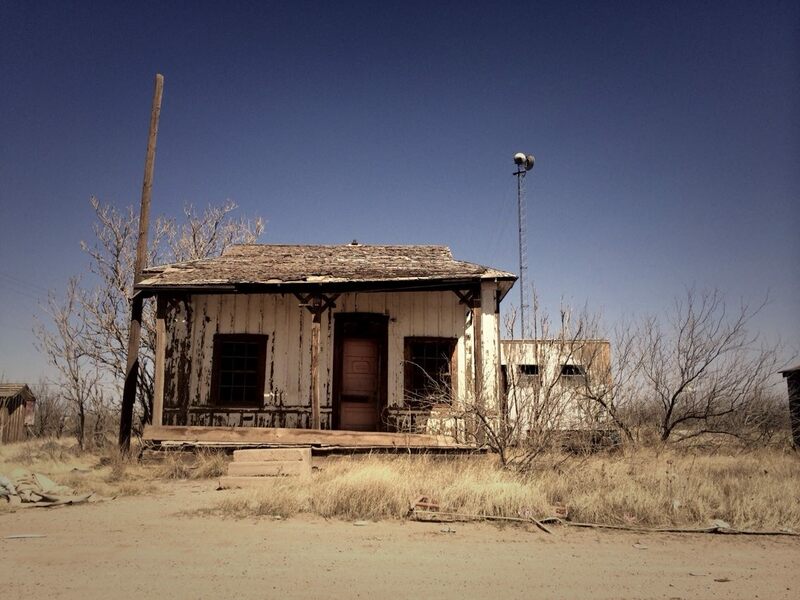 Drive north on the highway until you hit the New Mexico border. At mile marker 5 you will see a dirt road on the right, pay attention or you’ll miss it. Take this road and pay attention to which way the wind is blowing. You can camp anywhere off the road but you don’t want the dust from the road falling on your tents as trucks will be using the road all night. By trucks I think he meant RV meth labs. Luck was in our favor as a nearby camper heard our plight and offered up his site. The night was cold for him and he would rather just sleep in his car. I think he heard that we were from Maine and figured that the winter night in Texas would be no colder than summer nights way up in Maine. He was mostly right. We set up camp, cooked some dinner, passed around some beer and wine and looked at the stars and moon with binoculars. We hit the sack a hour or so after dark, excited for the next morning. We awoke to sunrise over the Chihuahuan desert and the howl of coyotes. It was the stuff of dreams. Except, that it was colder than most dreams. While filling water bottles, spilled water was freezing to the metal picnic table. It was a frosty cold morning, but not too cold for a bunch of Mainers. We got packed up for the hike and headed to the trailhead. On the way I noticed water was dripping from Mike’s backpack. We stopped so he could check his bladder and realized that the cover was no longer holding its seal. He headed back to the campsite to fill a couple of spare bottles. It is so dry in the desert that it is suggested that you carry at least 1 gallon of water per day. That is twice what I would normally carry for a dayhike, but it proved to be appropriate. Even though I did a bunch of winter hikes in February, I quickly realized how out of shape I was. These were not New England trails, they didn’t shoot straight to the summit following a ridge. The trails were nicely packed dirt and they switchbacked the entire way to the summit. The elevation gain was about 750′ per mile, but I was still out of breath pretty quickly. I soon shed my fleece and sweatshirt as the temperature quickly rose out of the 30s. Even though the hike had just begun, the views were already incredible. Without the deep forests of the north and with the surrounding desert and prairies, there was little to obscure the view besides other mountains. 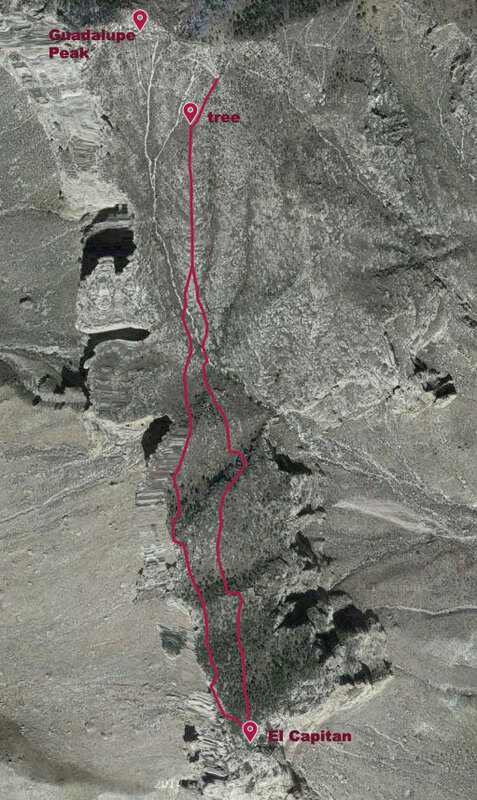 About a mile and half into the hike we had switchbacked up a face of the mountain and cut north of a ridge line. At that point we entered a small bowl on the northern face of the ridge and the trail dove into some pinyon pine trees. Though we lost the wondrous views for a while, this was one of the more interesting stretches of the hike. 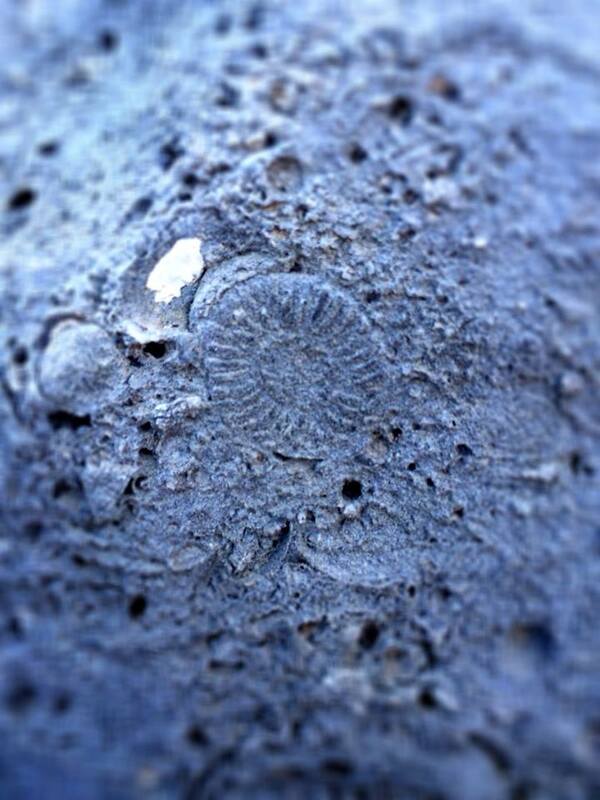 All along the side of the trail were large gray stones, and searching them carefully would reveal fossils. 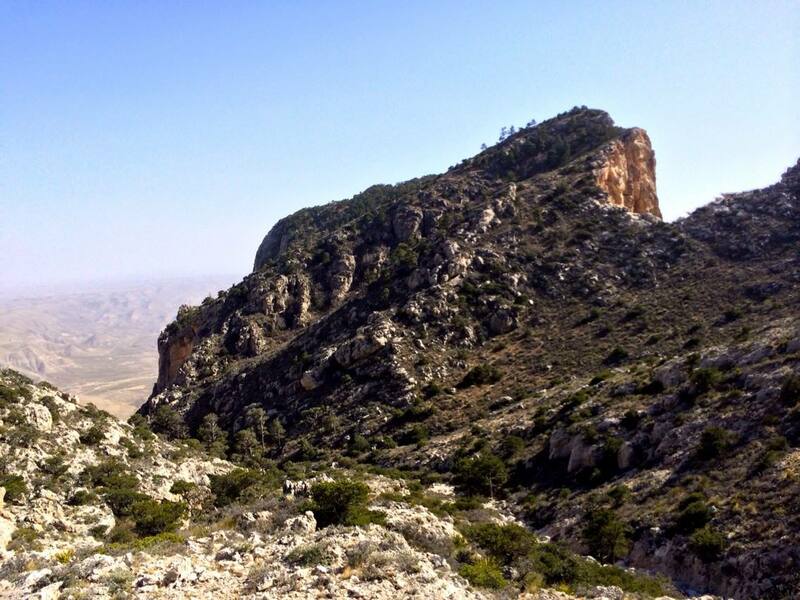 Here we were 7000′ above sea level and there were ancient reefs with fossils embedded on the side of the mountain. It was hard to believe that the mountain we were hiking was part if a massive reef system in the Delaware Ocean 300 million years ago. The trail continued to follow the ridge line toward the peak, but on the slope rather than the peak of the ridge. A few more switchback brought us around a corner where we saw a small flat peak to the right which soon proved to be the location of the Guadalupe Peak back country campground. We had considered getting up early and waiting in line at the visitor center in hopes of getting one of five available daily permits that would have allowed us to camp there that night. Instead we had opted to hit the trail early so we would have a better chance of having enough time to bushwhack to El Capitan. After the campground a sign stood telling horseback riders to walk their horses through the next section. To the right of the path a cliff dropped several hundred feet down and up ahead there was a small bridge over a gap in the trail. 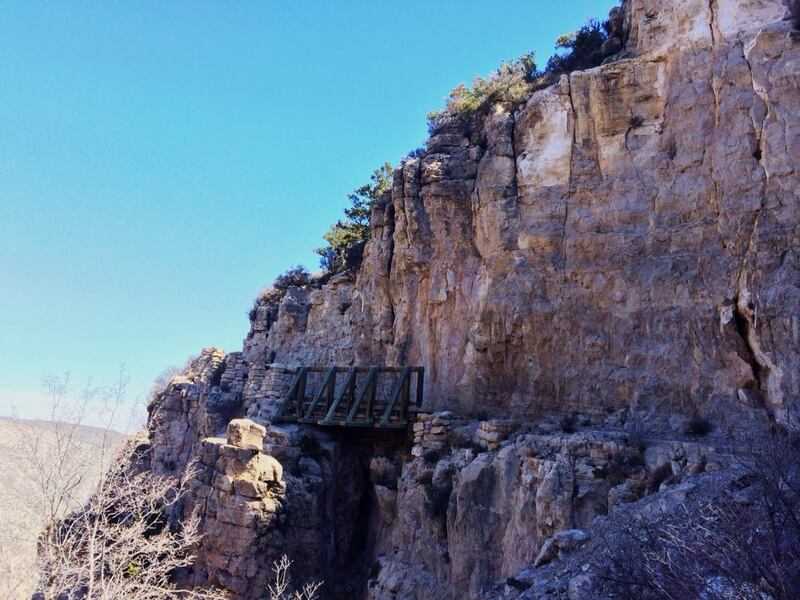 We stopped to take some photos of the bridge and risk a look over the edge of the cliff. Soon after the bridge the trail moved over to the south side of the ridge and we got our first sight of El Capitan. 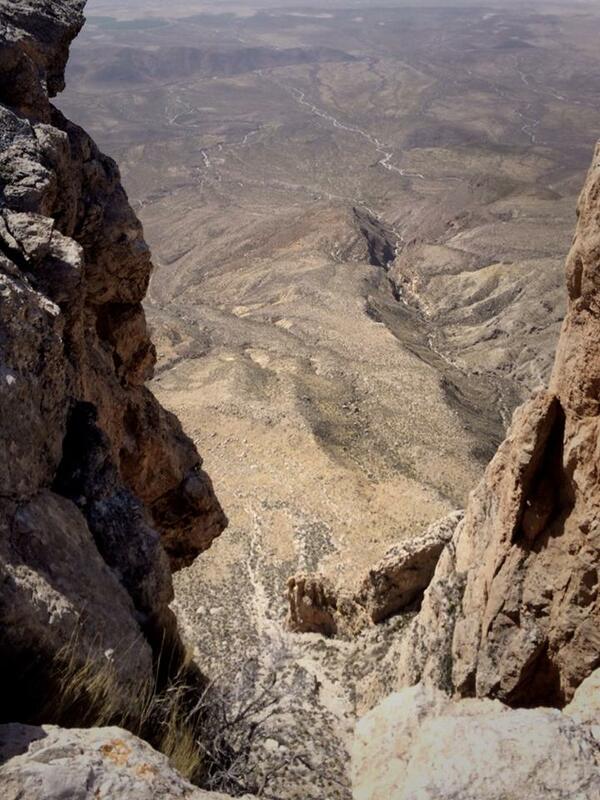 The slope of Guadalupe dove down nearly 1000′ to a ravine deep between the two mountains. Slides of white stone stood out starkly against the tans and greens of short vegetation. On the other side of the ravine the slope of El Capitan rose 800′. The mountain itself was queer to the eye, the western side being much higher than the eastern and both sides dropped shockingly to the desert below. We all knew at once that we must climb it. 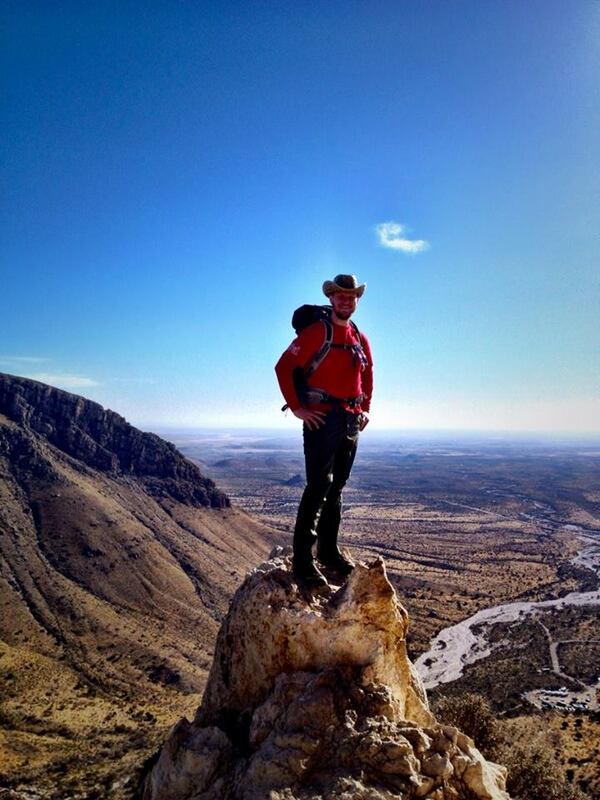 We climbed the remaining half mile to the top of Texas. I don’t recall if this portion was tough or not, only that it continued the switchbacked pattern of the rest of the trail. My mind was on El Capitan. The view from the summit was amazing. 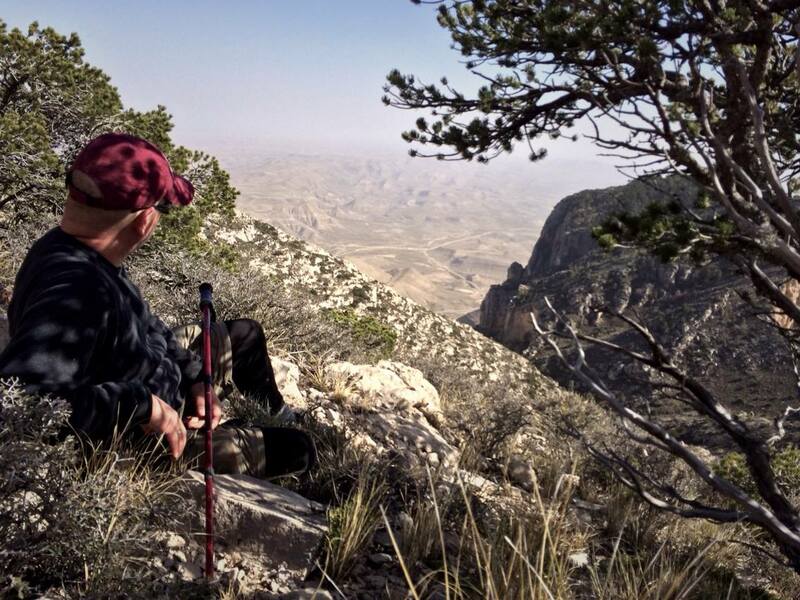 To the north and northeast was the rest of the Guadalupe Mountains range. To the east was the flat peak of the back country campground and the rest of the ridge that we climbed to get to the peak. 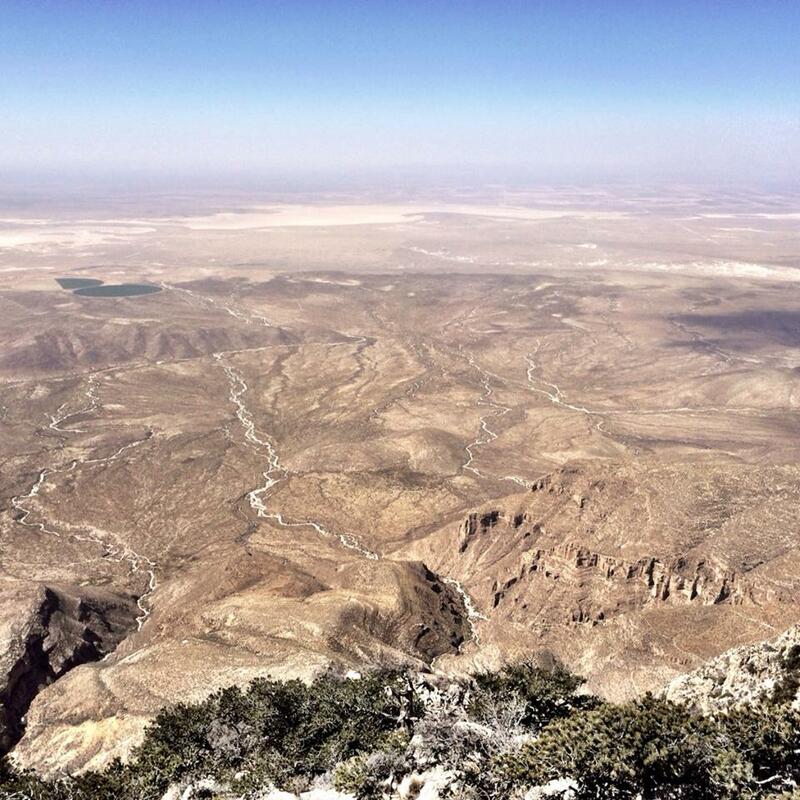 To the south was El Capitan and to the west was the white flatness of the Chihuahua Desert. Despite the haze in the distance, I felt that I could see farther than I had ever before. It was truly incredible. We sat, surrounded by a dozen other people who made the trip up that morning, and cooked some lunch. 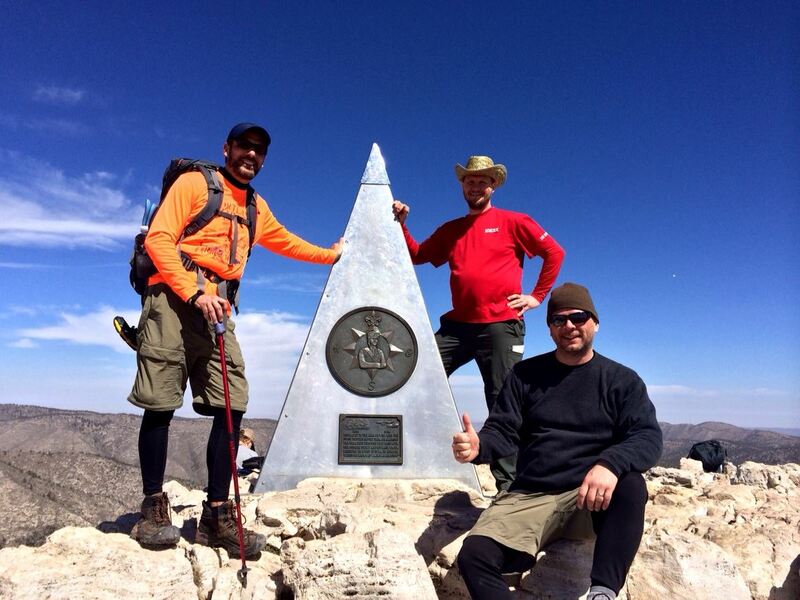 We signed the summit register and had our photos taken at the stainless steel pyramid that American Airlines had installed on the summit in 1958 to commemorate the 100th anniversary of the Butterfield Overland Mail Company. In the 1930s American Airlines received a government contract for air mail between St. Louis and San Francisco, the same route that Butterfield Overland Mail Company had serviced. One of their stops were at the stage station near what is now the Pine Springs campground. While John and Mike explored the summit, I stood at the south side looking down at El Capitan. Man, it was a long way down and back up to the peak, and it was looking really far away. I started considering whether we would have enough daylight. Then there were the rattlesnakes that the guy at REI in Austin warned us about. They were starting to come out of hibernation in March and were more aggressive when they did. So far we had been on trail the whole way, if we bushwhacked over to El Capitan we would certainly have to step through bushes and over dead logs. I expressed my concerns to John and he replied: “You only live once.” He was right, we would probably never have the opportunity to hike that crazy looking mountain again, we better just do it. We did a little research and planned our route and then headed down the trail to the point where we would start bushwhacking toward El Capitan. After the hike over to El Capitan we were pretty much beat and looking forward to making it back to the campsite. Luckily the path was flat and not too steep all of the way to the trailhead. We made good time and got back to our campsite before sun had set. 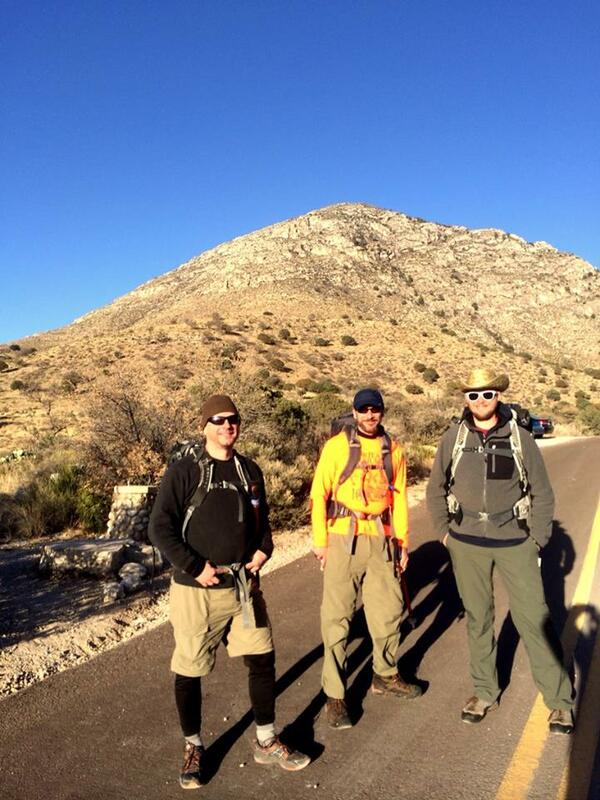 The combination of Guadalupe Peak and El Capitan is probably my favorite dayhike I have done to date. It was totally worth the eight hour drive across western Texas. I had my doubts about doing El Capitan, but my hiking mates’ enthusiasm easily outweighed my doubts. If I had done this hike solo I probably would have skipped El Capitan, so I was very thankful to have John and Mike with me to ensure that I seized the moment. “Camping and Hiking.” reddit.com. reddit inc. Web. 27 March 2014. 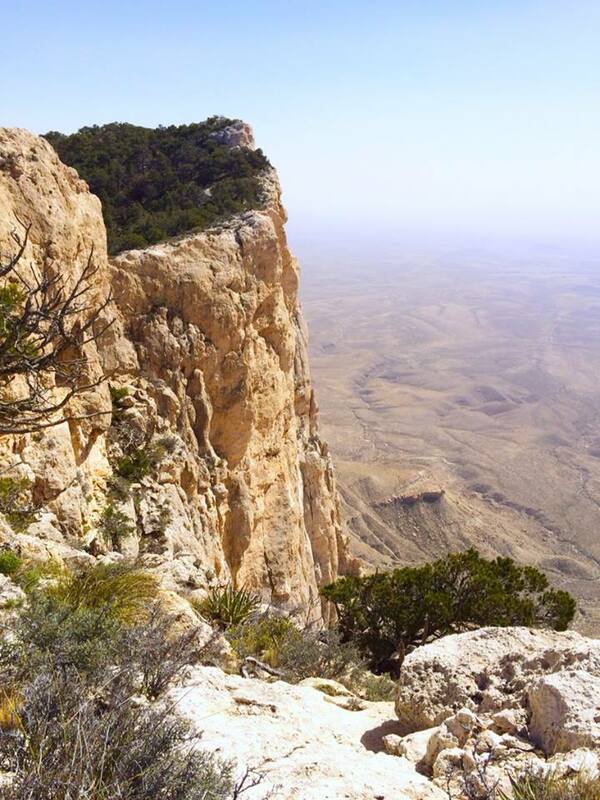 “Carlsbad Caverns National Park.” nps.gov. National Parks Service, U.S. Department of the Interior. Web. 29 March 2014. 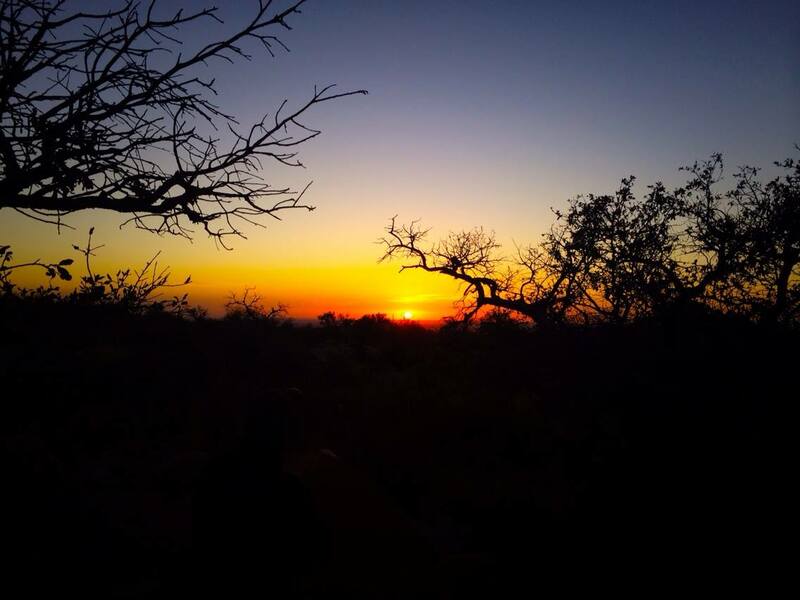 “Enchanted Rock State Natural Area.” tpwd.state.tx.us. Texas Park and Wildlife Department. Web. 29 March 2014. “Geologic Formations.” nps.gov. National Parks Service, U.S. Department of the Interior. Web. 29 March 2014. 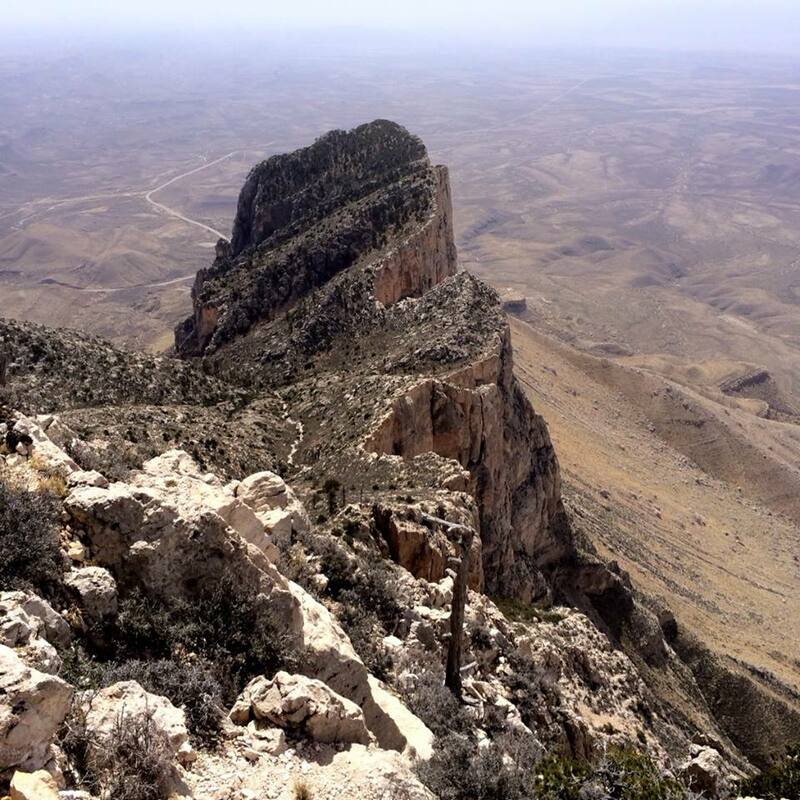 “Guadalupe Mountains, An Administrative History.” nps.gov. National Parks Service, U.S. Department of the Interior. Web. 29 March 2014. 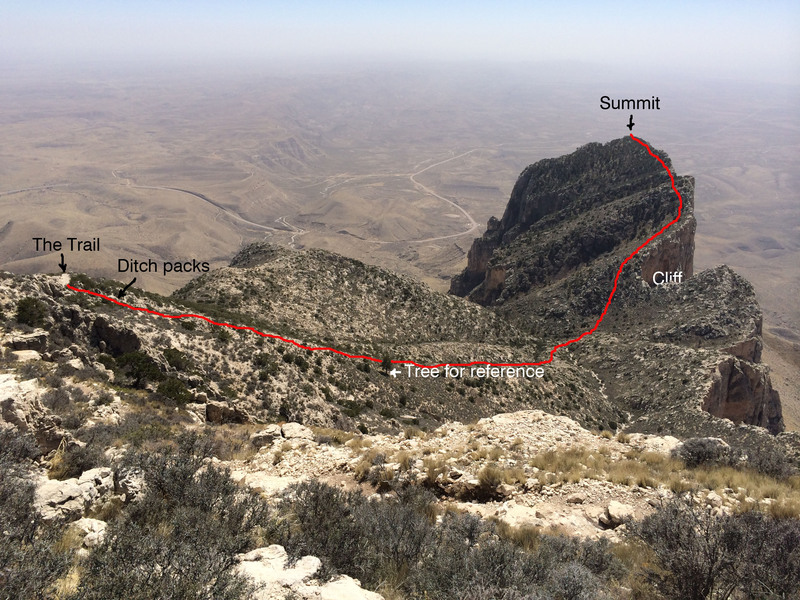 “Viewing Guadalupe Peak.” mapmyhike.com. Map My Hike. Web. 29 March 2014.